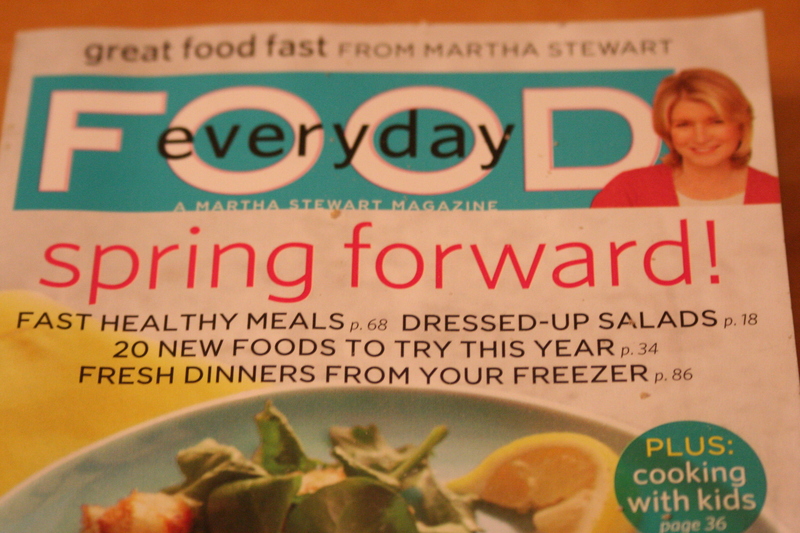 (Heather) - Now that we are well into 2010, the food magazines have begun to arrive en masse. 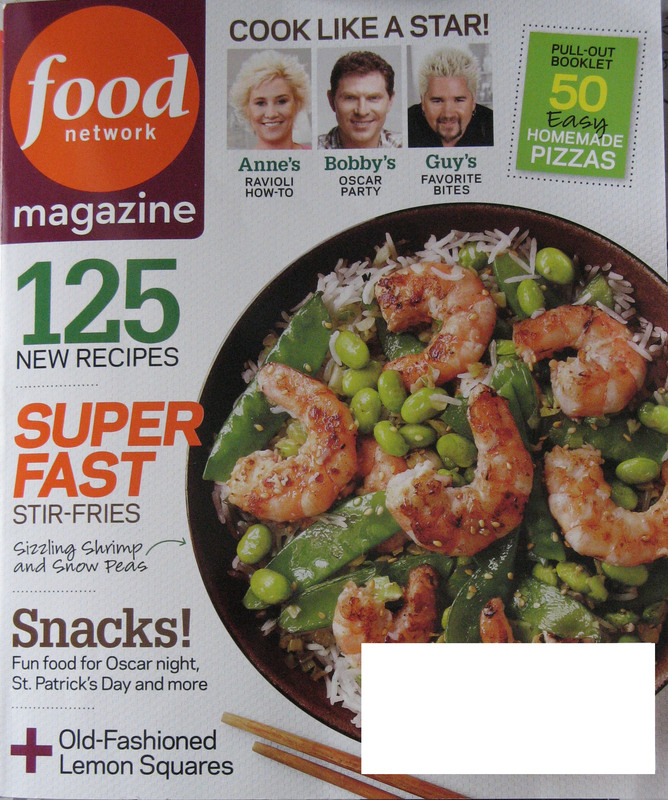 First up this month is Food Network. The March issue encompasses 140 pages. Along with all the normal features (such as Food News, Star Kitchen, Fun Cooking, He Made-She Made, and Copy That), there are a number of great feature articles which include: cooking with orange juice concentrate, 11,375 stir-fry possibilities complete with some amazing photos, easy green snacks for St. Patrick's Day, Weeknight Cooking and Weekend Cooking -- all of which have very appealing recipes, a Ravioli how-to, and a pull-out booklet on 50 Pizzas. The magazine ends with a lengthy spread devoted to the upcoming Oscars, including Hollywood-specific recipes. I chose a recipe from the On The Road feature -- Green Apple-SourDough Pancakes. 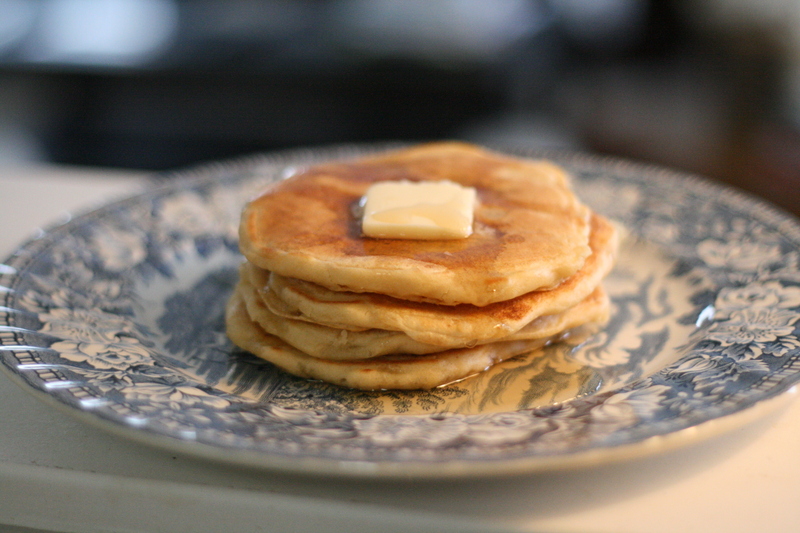 I love the smell and taste of sourdough and these pancakes were lovely. And my kids ate them right up too! Make the sourdough starter: Warm the milk in a small saucepan over low heat to about 110F. Transfer to a medium bowl, sprinkle with the yeast and let stand until foamy, about 5 minutes. Whisk in the cider, brown sugar, butter and 1 cup flour until smooth. Cover with plastic wrap and let stand at room temperature overnight. The next morning, make the pancakes: whisk 1/2 cup flour, the egg, baking soda and apple into the sourdough starter. Melt 1 tablespoon butter in a cast-iron griddle or non-stick skillet over medium heat and swirl to coat. Pour about 1/4 cup batter onto the griddle for each pancake. (Alternatively, cook on an electric pancake griddle.) Cook until the tops are bubbly and the edges set, about 3 minutes, then flip and cook until golden and cooked through, 1 to 2 more minutes. Repeat with the remaining batter, adding more butter as needed. Drizzle with syrup and garnish with pecans, if desired. 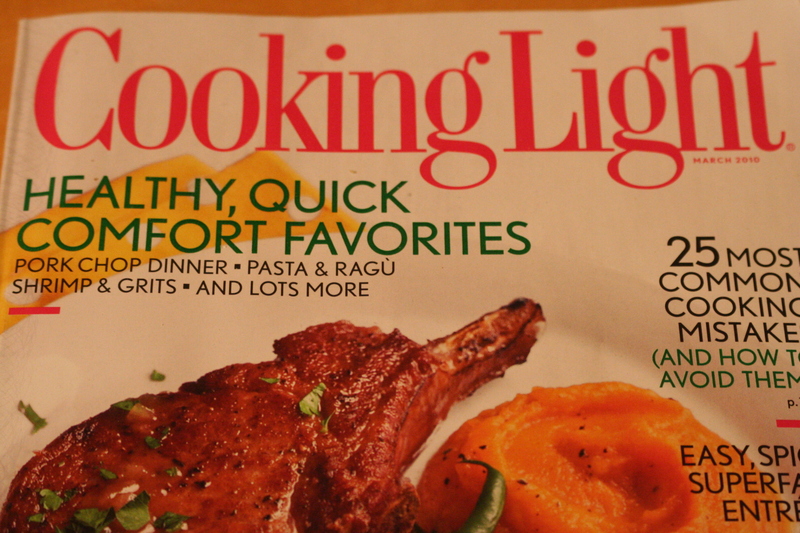 As always the magazine includes some great suggestions for 30-minute meals, as well as a section on classic dishes (think chicken noodle soup, chocolate cake, apple pie, lasagna). 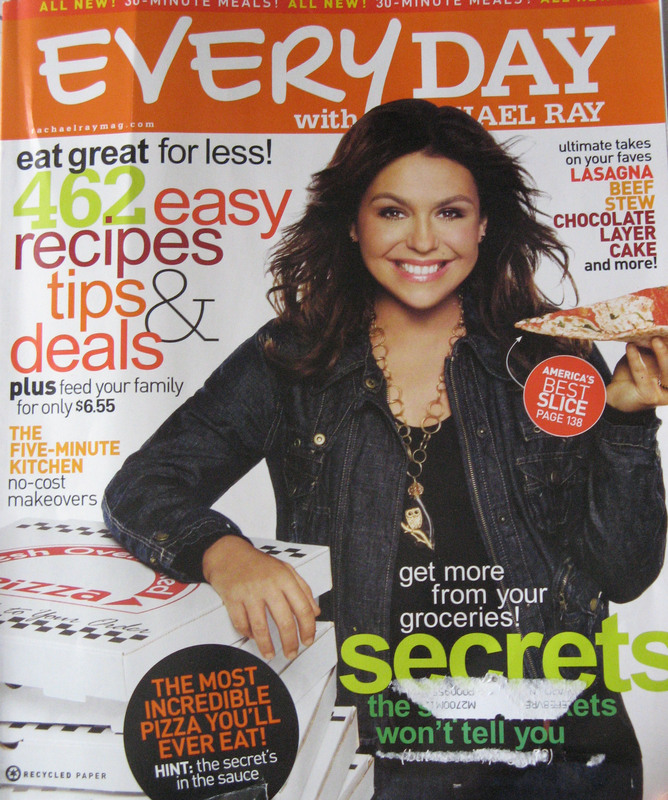 Recipes for Oscar night fill several pages and, wouldn't you know, there's a lengthy article on the nation's best pizza and how to make it (do magazine editors consult each other?). I will mention that my biggest pick with this issue was from their Supermarket Traps article. The article actually encourages you to "save produce shopping for last; this will prevent overbuying." Their argument being that produce has the highest profit margin and supermarket owners want you to buy a lot. In my opinion, fresh produce is what you should be filling the bulk of your cart with. The more fresh food we eat the more likely we are to have good health. 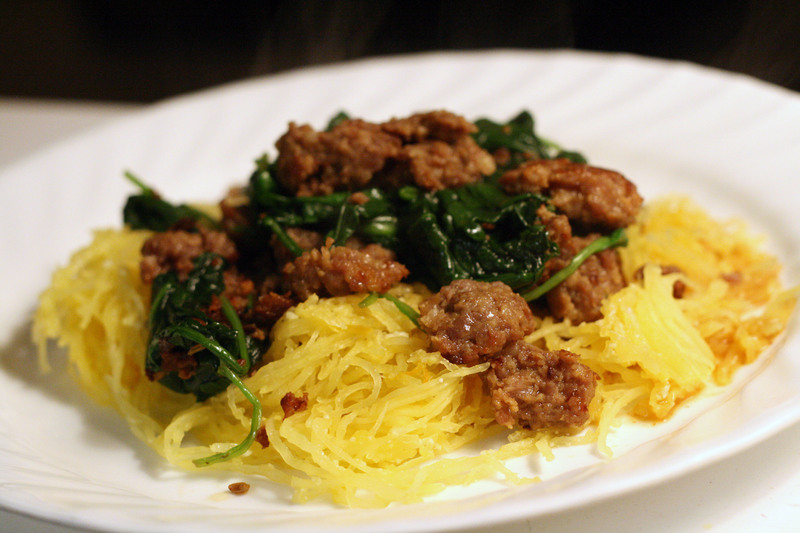 The Spaghetti Squash with Sausage and Greens from the $10 Dinners caught my attention. The recipe worked well and tasted great and one could even substitute regular pasta for the spaghetti squash. The magazine has you cook the spaghetti squash in the microwave. Because I try to avoid microwave cooking I placed my halved squash in a baking pan, added about 1-inch of water and baked it at 350F for 45-60 minutes until tender. Meanwhile, in a large skillet, heat the olive oil over medium-high heat. Add the sausage and cook until no longer pink, about 6 minutes. Add the spinach and crushed red pepper and cook until wilted, about 2 minutes; season with salt and pepper. Using a fork, comb the cooked squash into strands into a bowl. Toss with the parmesan and season with black pepper. Serve the spinach and sausage over the squash. (Alaina) - Everyday Food is focused on spring! It has some wonderful looking salad recipes, a whole section on poaching eggs and recipes for them, five different uses for homemade pizza dough (which all look amazing! ), as well as their usual meal plan with grocery a list. I continue to be impressed with this magazine. They make gourmet food easy! The Beer-Braised Sausages with Warm Potato Salad, Almond Torte with Pears and Whipped Cream, and the Swiss Chard Pie are just a few of the recipes I would love to try! I decided to try the Orecchiette with Bacon and Tomato Sauce - Orcchiette is a small shell-like pasta which I didn't happen to have on hand so mine was actually Orzo with Bacon and Tomato Sauce. 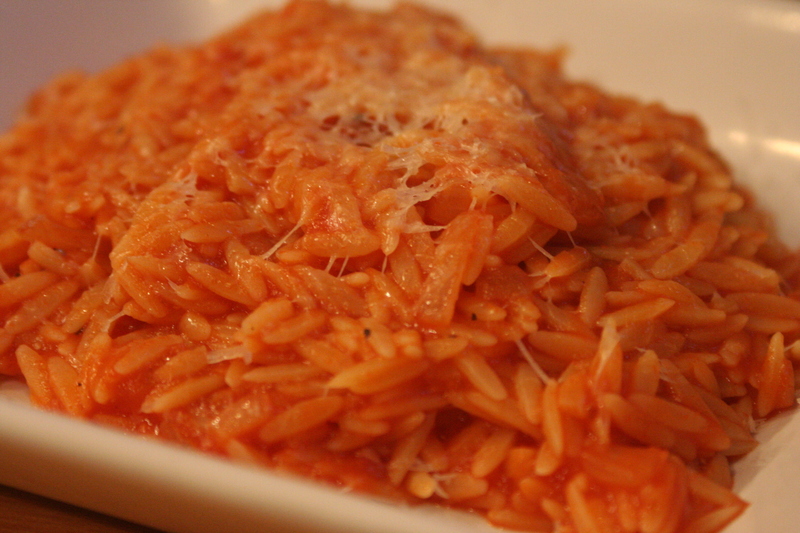 Orzo is a small pasta that looks a little like rice. It worked well. This was a little spicy for my kids, so I would reduce the red-pepper flakes to 1/4 tsp. The smoky bacon is so good in this simple dish! In a medium saucepan, heat oil over medium-high. Add bacon and cook until browned and almost crisp, about 4 min. Add onion and cook until softened, 3 to 5 min. Add garlic and red-pepper flakes and stir until fragrant, 1 min. Add tomatoes, breaking them up as you go, and season with salt and pepper. Bring sauce to a boil; reduce to a simmer and cook until slightly reduced, 15 min. Meanwhile, in a large pot of salted water, cook pasta 1 minute less than package instructions. Reserve cup pasta water; drain pasta and return to pot. Add sauce and pasta water to pasta and toss to combine; cook over medium-high until sauce thickens and coats pasta, about 2 min. Serve pasta topped with Parmesan and parsley. (Alaina) - Cooking Light has a wide variety of recipes including many different proteins and vegetarian dishes. The photos are inspiring and the articles interesting. I especially enjoyed the article on 25 Most Common Cooking Mistakes - and yes, I'm definitely guilty of some of them! The Lentil-Barley Burgers with Fiery Fruit Salad, Apricot-Ginger Bellinis, Pear & Prosciutto Pizza, and Braised Short Ribs with Egg Noodles all look amazing. I decided to try the lightened up Sour Cream Coffee Cake which was actually one of the Cooking Light staff favorites! And I agree - it was surprisingly delicious! I used yogurt which is the perfect substitute for sour cream if you don't have any and since mine was fat-free plain, it reduced the fat in this recipe even more! Spread oats in a single layer on a baking sheet. 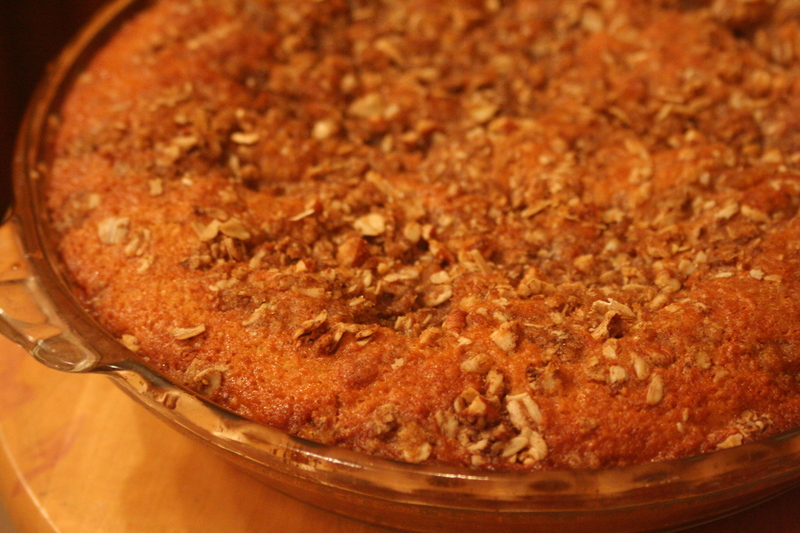 Bake at 350 for 6 minutes or until oats are barely fragrant and light brown. Coat a 9-inch springform pan (I used a regular 9-in. round glass baking pan) with cooking spray; set aside. Reserve 1/4 c. oats; set aside. Place remaining oats in a food processor; process 4 seconds or until finely ground. Combine flours, processed oats, baking powder, baking soda, and salt; stir with whisk. Place a granulated sugar, 1/4 c. brown sugar, and 1/3 c. butter in a lg. bowl. Beat with a mixter at medium speed for 3 min. or until light and fluffy. Add eggs, 1 at a time, beating well after each addition. Beat in vanilla. Add flour mixture to sugar mixture alternately with sour cream, beginning and ending with flour mixture. (Batter will be slightly lumpy because of oats.) Spoon batter into prepared pan; spread evenly. Combine remaining 1/4 c. oats and 1/4 c. brown sugar, nuts, and cinnamon in a bowl. Cut in 1 Tb. butter with a pastry blender until well blended. Sprinkle top of batter evenly with nut mixture. Bake at 350 degrees for 38 minutes or until toothpick inserted in center comes out clean, top is golden, and cake begins to pull away from sides of pan. Cool cake in pan for 10 min. Serves 10. What a lovely post filled with many tasty recipes.. mmm! It’s in point of fact a nice and helpful piece of info. I am happy that you shared this helpful tidbit with us. Please keep us up to date like this. Thanks for sharing. I have recently started a blog, and the info you provide on this website has helped me greatly. Thank you for all of your time & work. say is valuable and all. But think about if you added some great graphics or video clips to give your posts more, "pop"!